DOES THE STEEL IN YOUR SHED MEET AUSTRALIAN STANDARDS? Most sheds are designed and built in Australia, but in some instances the shed and the steel is made somewhere else. Shed Boss sheds feature steel made by BlueScope Steel – which is 100% Australian made and guaranteed to meet or exceed Australian Standards. COLORBOND® steel conforms to AS 1397-G550-AM100 and AS 2728. GALVASPAN® steel (e.g. C-Section, purlins and girts) conforms to AS 1397-G550-Z350. DOES YOUR SHED HAVE A WARRANTY? In addition to the workmanship that goes into your shed, make sure the steel used in your shed has a warranty you can trust. For example, pouring a concrete slab inside your shed can void the 20 year COLORBOND® warranty - a poor building practice which some builders use to make a cheaper quote, however the true cost is voiding this 20 year warranty, and the likelihood of your shed rusting out in as little as 2 years. This is because pouring concrete inside a shed will result in accelerated corrosion due to contact with wet cement, which is strongly alkaline, and the shrinkage of cured concrete which enables the build up of dirt and debris left in the gap left between the slab and the wall. At Shed Boss Fleurieu, we pour the concrete slab to a precise size prior to construction – with the drip-free edge of the wall sheeting extending 50mm down the side of the slab, without touching the slab itself. This enables moisture to drain freely from the sheared edge of the steel. This means that the risk of corrosion caused by condensation, or hosing the shed out, is eliminated. Plus, you can take advantage of the 20 year COLORBOND® warranty. IS IT GENUINE COLORBOND®, ZINCALUME® and GALVASPAN® STEEL IN MY NEW SHED? Look for the brand. Shed Boss sheds features COLORBOND®, ZINCALUME® and GALVASPAN® steel, with the brand marking printed on the reverse side of the steel. Made only by BlueScope Steel these registered brands have built a reputation as some of the most trusted building materials in Australia. IS YOUR SHED DESIGN ENGINEERED SPECIFICALLY FOR YOUR SITE? Like your house, your shed should also be engineered specifically for your site. Every shed is different in terms of the site, exposure to the elements and distance from other buildings. Combining this data with other important information such as the intended use of your shed and the wind speed enables Shed Boss Fleurieu to decide the right design specification. For absolute peace of mind Shed Boss Fleurieu is ShedSafe Accredited. Our accreditation means that not only have our sheds met all the ShedSafe criteria for tough Australian conditions, including coastal salinity and cyclone zones, but that we have also undertaken training that ensures we will recommend a shed that is engineered for your site conditions and usage needs. It's a double layer of protection for you. WILL YOUR SHED STAND UP TO AUSTRALIA'S HARSH CONDITIONS? Around Australia, scientists have tested BlueScope steel products for over 45 years in some of the country's harshest climatic conditions. Australia has some of the highest UV levels in the world, which can play havoc with painted steels. In fact, AS2728 requires pre-painted steel used in buildings to be tested in designated extreme climates throughout Australia, including sunshine exposure sites. And as required by the Standard, testing is conducted for performance attributes such as blistering, cracking, flaking and peeling. 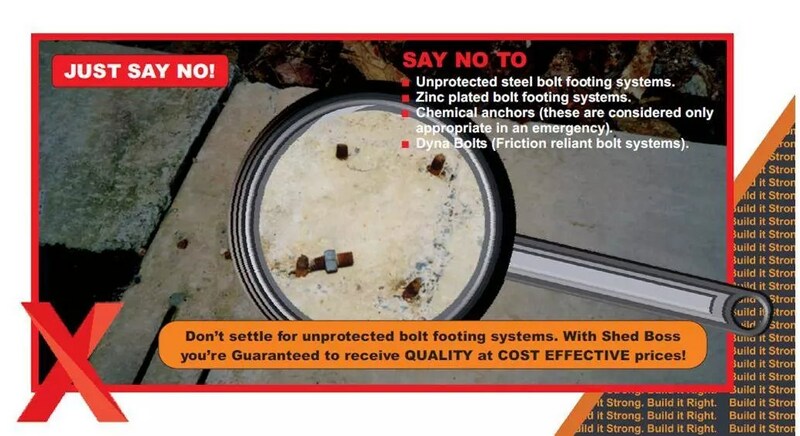 In other words, COLORBOND® steel is tested against defects that you do not want to see appearing on your shed. What's the concrete specification for a shed? The size of your concrete slab will depend on the specifications you choose for your custom shed. In general, though, for most domestic sheds we pour 100 millimetres of concrete per 25 megapascals (compressive strength of a foundation) and use F62 mesh on chairs and forticon. For example, the type of soil o your property could impact the concrete slab. When we carry out our preliminary research on your property, we will identify the soil classification (SC) and accordingly plan the concrete laying process because different SC affects concrete differently. What's the importance of getting a written proposal/quotation? When obtaining quotes, always insist on a specification sheet on your written, detailed quotation with GST inclusive prices – this will allow you to compare apples with apples. If you don’t have a written quote with a specification sheet, there’s no way of knowing what you are actually buying. Some shed retailers don’t provide this information and this means buyers can pick the wrong shed based on a price only, and end up becoming an owner builder. When you decide to build a shed on your property,, you want to know that your product is going to be safe and sound for the years to come. That is why Shed Boss take steps to achieve Shedsafe accreditation. But what is it, and what does it mean for you? Shedsafe is a system designed to recognise excellent safety practices in shed construction, and is managed by the Australian Steel Institute (ASI). As the voice of the national steel industry, their qualifications carry significant weight, so when you use a shed indicated by the ASI system as safe, you know it is trustworthy. Shedsafe accreditation adheres to rules outlined in the Building Code of Australia, which further ensures best practice and high quality sheds. A Shedsafe operator has to undergo the appropriate training and regular maintenance checks, ensuring that they continue providing high quality in both safety and efficiency. The Shedsafe initiative began in the wake of Cyclone Larry, which struck Queensland in 2006. The ASI was tasked with creating guidelines for steel sheds that would ensure they could withstand tests from nature such as this cyclone, and the Shedsafe programme was borne from this to ensure ongoing compliance with top quality practices. Shedsafe identify wind as the biggest concern that all sheds need to stand against, and as their third-party system uses the Building Code of Australia for guidelines, it ensures that your product will withstand strong gusts which could cause damage to a shed that is not designed properly. This means when you get a customised building from a Shedsafe accredited company like Shed Boss Fleurieu, it is built to survive incredibly rough conditions. When you're looking into purchasing your own custom designed shed or garage, one thing you may not have considered is the direction your new installation will face. There are a number of benefits to doing just this, with different property orientations potentially changing a wide range of factors to do with your shed's atmosphere and climate. For example, a lot of this has to do with the movement of the sun. Taking this into account can help you to save money on heating your shed, by taking advantage of the natural warmth provided by the sun. Therefore, placing big windows on the northern orientation your shed will allow for the maximum amount of sunlight to penetrate your garage, providing you with warmth during the cooler winter months. This principle also needs to be observed for those interested in solar power. By putting your panels on the northern side of the building, you'll ensure you get the most out of each day's sunlight – maximising the power output of your solar power installation. Depending on how much time you spend in the shed, installing windows on the eastern and western walls will capture the morning and evening sunlight, respectively. If you spend a lot of time in your shed during these times, additional windows could be something to consider. Keep an eye out for the position of your shed with relation to cooling winds in the summer. If you build it where the breeze is obstructed, it could become an extremely warm environment during the already scorching Australian summer. These are just some things to consider when building your own custom designed shed. Keeping you and your family comfortable should be a main priority when it comes to creating a residential garage at your home. Yes, it's possible that the type of soil you have on your property will affect the specifications of your concrete slab. Soil classification (SC) is one of the first things we'll work out when preparing for laying the foundation, alongside the intended use of the building and its class under the National Construction Code. SC is how we judge your ground's reactivity, or in other words, how it will change in volume based on its likely swell and shrinkage rates. After we have your site plan, structural details and any other elements of paperwork needed for council approval collated and submitted, the average council approval process can be between four and six weeks. Some applications are more complex and need referrals and/or public notification which can take extra time. The quality and accuracy of the information included with your application can also affect the time taken to assess the application. An application which has all the required information can generally be assessed faster than one which requires further information. When you choose Shed Boss Fleurieu to take care of the complete project, we'll thoroughly prepare the Council development application to avoid any possible problems with the proposal before your application is lodged. This will save you time and possibly money, as it will reduce the possibility of you having to amend your plans later on. What is home warranty (builder’s indemnity insurance)? This insurance protects consumers from financial loss caused by a builder's failure to rectify or compensate for defective or incomplete residential building work. Such insurance is a statutory product, meaning that it is compulsory under relevant building legislation South Australia. Shed Boss Fleurieu (as a builder), will take out this insurance where the building work is over the amount of $12,000. Non completion of the building contract when the builder dies, disappears or becomes insolvent. Failure of the builder to correct faults, which are deemed by law to be the builder's responsibility, for a nominated warranty period. These contingencies are poor workmanship, faulty design, and inadequate or unsuitable materials. Contract Works insurance protects against damage to the works under construction, in addition to damage or injury to third parties or their property. Shed Boss Fleurieu has a Contract Works policy, which will insure your shed during from material (kit) form, delivery to site, through to the construction stage until it is officially handed over to you (practical completion). However, it is your responsibility to protect and insure any items owned by you at the building site during the construction stage and beyond. Shed Boss Fleurieu also holds $20 million public and product liability insurance for any damages that we have become legally liable to pay, in respect of third-party (other persons) personal injury or property damage, as a result of an occurrence in connection with our business. Public liability insurance provides cover for occurrences that happen whilst your works are actually being performed, and products liability provides cover for occurrences that happen after the works have been completed and handed over. Shed Boss Fleurieu was established in 2005 and we have always traded under this name. When researching shed builders, it's a good idea to find out how long the builder you are considering has existed and whether it has always traded under the same name. A builder that has changed names may be a sign of past problems they wish to avoid. The average life of a building company in Australia is less than four years. A builder who has been trading for more than four years is usually the sign of a company with a good business profile and who has been successful to date. You can choose from any combination of the 22 colours from the COLORBOND™ steel range. This ensures your shed or garage will perfectly match the colours you've chosen for your home's COLORBOND™ steel roof, fence and gutters. What is the difference between BMT and TCT cladding? Are you getting thin tin? Insist on Base Metal Thickness (BMT) to manage your risk. The steel used in your shed should be measured as BMT (Base Metal Thickness), which is entirely structural material. Some suppliers give measurements as TCT (Total Coated Thickness), which includes coatings, about 0.05mm of extra thickness. This means that a BMT of 0.37mm and a TCT of 0.42 mm could be describing the same quality steel. Make sure you know the difference as different suppliers describe materials using different terms. All Shed Boss sheds made from BlueScope Steel are specified as BMT and meet Australian Standards for loads. Shed Boss follows best Australian practice by using a minimum of 0.42 BMT (Base Metal Thickness) high tensile steel for roofs and walls. Some manufacturers only use 0.30mm - even on the roof! What sort of warranties have you been offered? As all Shed Boss sheds are made from 100% Australian made Stramit steel building products, you've got a double advantage. You get Stramit's warranties on the performance of their products, plus BlueScope Steel's warranties* on the COLORBOND™ and ZINCALUME™ steel. Who's going to help if something goes wrong? If you have a problem with imported steel materials, can you be sure someone's going to be there to help you? Backed by Stramit and BlueScope, you have local technical representatives to provide superior technical advice. Is it up to standard? All the materials in a Shed Boss shed are manufactured in accordance with Australian Standards. Quality control systems in the factories make sure products are manufactured accurately to specifications. The COLORBOND™ and ZINCALUME™ products in a Shed Boss shed have a zinc/aluminium substrate that lasts up to four times longer than some imported galvanised coatings. The COLORBOND™ paint formula resists fading, chipping and cracking under Australia's harsh UV conditions. Have the products been tested under Australian conditions? COLORBOND™ steel is tested to Australian Standard AS2728 (for pre-painted steel sheet) which requires exposure to harsh sunlight and corrosive conditions for 48 months continuously at different sites. The materials also undergo accelerated indoor testing to ensure world-best products. Shed Boss sheds feature Stramit roofing and walling products with anti-capillary side laps to keep even wind-blown rain out. As Shed Boss sheds, garages and carports are made from Stramit steel building products, there's more behind your shed than you realise. For starters, you've got the backing of one of Australia's leading building product manufacturers. You also have Stramit Building Product warranties on performance as well as BlueScope Steel warranties* on the materials. Plus you have top-quality Australian steel and technical know-how based on experience of harsh Australian conditions. Stramit Building Products is a member of the Fletcher Building Group, the largest diversified building products group in Australasia, which has operations throughout Australia, New Zealand and internationally. *Warranty are offered by BlueScope steel and subject to application and eligibility criteria. For full terms and conditions and to determine the eligibility of your building for the warranty visit bluescopesteel.com.au/warranties or call 1800 022 999. ZINCALUME®, COLORBOND®, GALVASPAN® and BlueScope are registered trade marks of BlueScope Steel Limited. Can Shed Boss obtain Council Approval for me? Yes! This is just one reason why you should consider utilising the complete project service offered by Shed Boss. We will work with you from the design stage to completion, and that means we can obtain the proper permits and approvals, as well as help with the managing of similar applications. As we are the builder (BLD 236453), we take total responsibility for your project, and we will submit the Development Application to Council in our name, which means you don't need to take on the risk, hassles and liability of being an "owner builder". For more information, visit our Complete Project page. Can I build on (or near) the boundary? In most cases, Yes. However, each property is different. The structure may be located on the boundary with consent from your local Council – with the use of box gutters and a rainhead (your shed then forms part of the boundary, and will replace any existing fence line). If you are not building on the boundary, a minimum of 900mm for an enclosed structure (such as a shed or garage); and 600mm away for an open structure (such as a Carport, Awning or Pergola) may be required. For more information, contact us now for advice. What is my site design wind speed? We consider several site specific criteria to determine your design wind speed, in compliance with the Building Code of Australia and your council building regulations. Our ShedSafe accreditation demonstrates our commitment to ensuring your shed meets Australian Standards and is the best fit for your site and circumstance. Our written proposal will clearly show the full site specific design wind speed along with the criteria of our wind speed assessment. For further information, visit our ShedSafe page or start designing your shed online now. Development Approval (for both Planning and Building Rules Consent) can be granted by your local Council within approximately 4 to 6 weeks. If you choose Shed Boss for the complete project, as your builder, we can obtain Development Approval for you. What is needed for council approval? When choosing Shed Boss for a complete project, we will take care of the Council approvals for you, as properly prepared can save you time and money in the long run. Site plan showing the boundaries and dimensions of the site and location of your Shed Boss shed on your property. Dimensioned shed floor plans, elevations, sections and construction details (provided by Shed Boss, independently certified). When you contact us for a personalised proposal, we will gladly answer any questions, alternatively you may contact your local council regarding any specific inquiries or for further assistance concerning the use and development of land. Can I build the shed myself? Shed Boss are the leaders in design and technology. For the handyman we can provide a user friendly, pre-punched and pre-sized kit ready for construction. Your shed’s portal frames simply swing up into position. Your shed will be maintenance free with non-welded, rust and corrosion-free joints, which offer the longest capital investment on your property. Site specific design wind speed, as required for Council approval. Site and project-specific plans and drawings certified by 2 independent structural engineers. An easy to follow instruction manual and DVD are included in all shed kits. Delivery of all materials to your site, by crane truck. Site and project specific concrete slab layout drawings, engineering details and computations, gable framing plan. Hot- dipped galvanised “cast-in-slab” footing brackets: other method offers you the strength and security of this LIFETIME, heavy-duty hold-down system, and is also another reason why Shed Boss buildings are the easiest to install (However, steel reinforcing for the footings is not included). Class 4 “Marine Grade” fasteners: high quality self tapping screws with a leak free neoprene washer seal. Exclusive Morinda™ Glove Section Bracket System – a fully wrap around knee and apex joints that are made from heavy galvanised steel and feature pre-punched screw holes for quick and correct installation. Non-welded and corrosion free, Morinda™ brackets are designed to fit like a glove, combining both corrosion resistant galvanised bolt and screw connections. Plus, the pre-punched hole centres allow for huge time saving during installation. We also offer a Complete Project service if you would prefer us build your Shed Boss shed for you. How long does it take for my shed kit to be delivered? Upon payment, Shed Boss Fleurieu offers a 2-3 week delivery on our shed kit (materials), allowing you to have your shed built fast. The National Construction Code (NCC) has all Performance Requirements for the construction of buildings, achieving nationally consistent, minimum necessary standards of relevant, health, safety (including structural safety and safety from fire), amenity and sustainability goals efficiently. The NCC defines buildings in 10 Building Classes. Sheds generally fall into class 6, 7, 8, 9 or 10a depending on their intended use. Class 1 Building: Class 1 buildings are houses. Typically they are standalone single dwellings of a domestic or residential nature. Shed Boss Fleurieu is able to design a "shed" as a "house". Class 2 Building: Class 2 buildings are apartment buildings or a single storey attached dwelling where there is a common space below. For example, two dwellings above a common basement or carpark. Class 3 Building: Class 3 buildings are residential buildings other than a Class 1 or Class 2 building. They are a common place of long term or transient living for a number of unrelated people. Examples include a boarding house, guest house, hostel or backpackers, dormitory style accommodation, or workers’ quarters for shearers or fruit pickers. Class 3 buildings may also be “care-type” facilities such as accommodation buildings for children, the elderly, or people with a disability, and which are not considered to be Class 9 buildings - as well as the residential parts of hotels, motels, schools, hospitals, or jails. Class 4 Building: A Class 4 part of a building is a dwelling or residence within a building of a non-residential nature. An example of a Class 4 part of a building would be a caretaker’s residence in a storage facility. A Class 4 part can only be located in a Class 5 to 9 building. Class 5 Building: Class 5 buildings are office buildings that are used for professional or commercial purposes, excluding Class 6, 7, 8 or 9 buildings. Examples of Class 5 buildings are offices for lawyers, accountants, general medical practitioners, government agencies and architects. Class 6 Building: Class 6 buildings are typically shops, restaurants and cafés. They are a place for the sale of retail goods or the supply of services direct to the public. Some examples are a dining room, bar, shop or kiosk part of a hotel or motel; hairdresser or barber shop; public laundry; market or showroom; funeral parlour; shopping centre. Class 8 Building: A factory is the most common way to describe a Class 8 building. It is a building in which a process (or handicraft) is carried out for trade, sale, or gain. The building can be used for production, assembling, altering, repairing, finishing, packing, or cleaning of goods or produce. It includes buildings such as a mechanic’s workshop. It may also be a building for food manufacture, such as an abattoir. A laboratory is also a Class 8 building, even though it may be small in size - which is due to their high potential for a fire hazard. Class 9 Building: Class 9 buildings are buildings of a public nature. Class 9 buildings include three sub classifications: Class 9a, Class 9b and Class 9c. Class 9a buildings are generally hospitals which are referred to in the NCC as health-care buildings. They are buildings in which occupants or patients are undergoing medical treatment and may need physical assistance to evacuate in the case of an emergency. This includes a clinic (or day surgery) where the effects of the treatment administered would involve patients becoming unconscious or unable to move. This in turn requires supervised medical care (on the premises) for some time after treatment has been administered. Class 9b buildings are assembly buildings in which people may gather for social, theatrical, political, religious or civil purposes. They include schools, universities, childcare centres, pre-schools, sporting facilities, night clubs, or public transport buildings. Class 9c buildings are aged care buildings. Aged care buildings are defined as residential accommodation for elderly people who, due to varying degrees of incapacity associated with the ageing process, are provided with personal care services and 24 hour staff assistance to evacuate the building in an emergency. Class 10 Building: Class 10 buildings are non-habitable buildings or structures. Class 10 includes three sub classifications: Class 10a, Class 10b and Class 10c. Class 10a buildings are non-habitable buildings including sheds, carports, and private garages. Class 10b is a structure being a fence, mast, antenna, retaining wall, swimming pool, or the like. A Class 10c building is a private bushfire shelter. A private bushfire shelter is a structure associated with, but not attached to, a Class 1a building. ARE FARM BUILDINGS CLASS 7, 8, OR 10a? It depends on the occupancy, use and size. Buildings used for farming-type purposes are often very diverse in nature. For example a shed for parking a single tractor may be a Class 10a, however if multiple tractors and other farm machinery is parked, the building may be a Class 7a (or even a Class 8 if mechanics were employed to work on the machinery). The NCC defines a difference between a farm shed and a farm building. It also contains specific Deemed-to-Satisfy Provisions for these buildings under part H3 of Volume One. The NCC assigns four different building importance levels for structures. The assigned Importance level is consistent with the consequences of building failure and the risk to human life (or property) Level 1 is the lowest and level 4 the highest. Level 2 - Buildings or structures not included in importance levels 1, 3 or 4 – example garages, industrial buildings and school shelters with less than 250 students. A building that does not comply with the NCC poses an increased risk of failure and a potential threat to community safety. For absolute peace of mind, as licensed builders, Shed Boss Fleurieu can give assistance in determining the correct importance level and building specification for your shed. The information in this document is intended to be used as guidance material only, and is in no way a substitute for the NCC and related State and Territory legislation. The information in this publication is provided on the basis that all persons accessing the information undertake responsibility for assessing the relevance and accuracy of the information to their particular circumstances. Is there any welding in a Shed Boss shed? Designed to fit like a glove, combining both bolt and screw connections, this knee joint is voted the best in the industry. Its "glove tight" design ensures engineering integrity. Beware of any welded brackets, particularly if the weld is onto relatively thin "C" Purlin under 4mm. As the heat is applied and melts the purlin, under microscope, a trough is often revealed to be two thirds the thickness of the purlin. The protective Galvanizing is destroyed. Manufacturers who still persist with this process usually use a very cheap silver frost paint as rust protection. Always insist on a non-welded product. What is the Morinda glove section? Joints are the most important engineering consideration in your shed and ours are recognised as one of the best in the industry. The Shed Boss patented Morinda™ Glove Section Bracket System includes fully wrap around knee and apex joints that are made from heavy galvanised steel and feature pre-punched screw holes for quick and correct installation. Non-welded and corrosion free, Morinda™ brackets are securely fixed with galvanised bolts to make sure they stay strong and last. Because it is a fully wrap around moulded section, it absorbs most of the twist encountered in high wind conditions. The Morinda Glove Section was originally developed for cyclonic conditions. Remember, a shed is only as strong as these joints! Find out more by visiting our ShedMaker page. What quality fasteners/fixing screws do you use? Using the correct fastener for your shed is crucial to its long-term performance and good looks. At Shed Boss Fleurieu, we use high quality Class 4 fasteners, resulting in a quality touch to your very valuable asset. Corrosion free Class 4 roofing and walling fasteners are compliant to Australian Standards (AS 3566) for use in severe marine and coastal environments, complying with the COLORBOND™ warranty requirements. We fix the roof to the same standards and method as a residential house roof - including leak-free neoprene washers on the roof and the wall cladding, which cushion and seal these self-drilling screws. This ensures your Shed Boss building will stay dry and sealed in the heaviest rain and stand the test of time. Can Shed Boss Fleurieu build my shed for me? By choosing Shed Boss for a complete project, you only need to deal with one company. As a licensed builder, we take care of everything, from start – to finish, managing your entire project. We arrange all work to be performed from Council approvals, supply of all materials, installation and concrete. Plus, for absolute peace of mind we're fully insured throughout your project. How long does it take for my shed to be built? Once the concrete has been poured, most domestic sheds take 2-5 days to build. Is Shed Boss Fleurieu a licensed builder? Yes - our builders licence number is BLD236453. If you're too busy, let us take care of the complete project for you. We are also fully insured throughout the entire project, and members of the Australian Steel Institute, HIA and Master Builders and ShedSafe™ Accredited. For further information on the accessories and customisations available, please visit our CUSTOM DESIGN page. Why do you pour the concrete slab first? Did you know that pouring a concrete slab inside your shed can void your BlueScope COLORBOND™ steel warranty? "the Material must not be used as concrete formwork or be immersed, including during construction"
Pouring concrete inside your shed will result in accelerated corrosion due to contact with wet cement, which is strongly alkaline, and the shrinkage of cured concrete which enables the build-up of dirt and debris left in the gap left between the slab and the wall. At Shed Boss, we pour the concrete slab to a precise size prior to construction – with the drip-free edge of the wall sheeting extending 50mm down the side of the slab, without touching the slab itself. This enables moisture to drain freely from the sheared edge of the steel. *Warranty terms and conditions apply. Warranties are not available for all products and applications. The duration and terms and conditions of available warranties vary according to product use and application. What type of bracketry is used in your sheds? These massive heavy duty galvanised hold down brackets are cast into the slab, allowing portal frames to simply swing up into position. Just one of the reasons why Shed Boss sheds are the easiest to install. Beware of builders who use cheap friction bolts or chemical anchors (glue). Our heavy galvanized steel anchor brackets are specially designed and set in concrete for increased hold down strength to withstand the fiercest weather conditions in South Australia. Fully engineered for the highest design wind speed of up to 87 metres per second. Due to the use of stirrups, the frames of the shed are lifted off the concrete floor by 5-10mm ensuring that concrete will not speed up the corrosion process thereby giving your a shed a longer lifespan. Voted best in the industry. This incredible invention allows for the most stable and strongest knee joint in the industry due to its full wrap around and dual use of heavy duty bolts and screws to fix. Remember, this is the most important engineering point in your shed - both sides of the knee joint should be fixed. Clearly we advise, don't settle for a single plate system when you can have this superior full wrap around Glove Section. What is the standard size roller door? Our standard roller doors are a full 2.750M wide (over 9 feet), giving easy, drive-in access for even the largest 4WD vehicle. Other size roller doors are also available in heights of up to 5 metres and a width of up to 5.1 metres. When you use the Shed Boss App to put together a custom design for your shed, you will notice the different options for doors that you can install. Of course, we can fit an optional remote control system (with 2 hand-sets), which will save you from having to get out of your vehicle to manually open your garage. Instead, you can simply click it open and drive right in without getting out of the car. Ask us about the optional WIND LOCK option - recommended in high wind areas for added strength and security. For more info on our roller door options, visit our CUSTOM DESIGN page. Are gutters included in your quotation? Yes, gutters are included in our quotations. We include wide, large capacity COLORBOND® or ZINCALUME® gutters as standard. Plus, when you choose Shed Boss Fleurieu for the complete project we'll install 90mm white PVC downpipes (to ground level), which you can connect to rainwater tanks or storm-water drains. Can you custom design my shed? We sure can, in fact it's our speciality! Visit our CUSTOM DESIGN page for more information, or custom design your shed online using the Shed Boss App. Does the steel in your buildings meet Australian Standards? Most sheds are designed and built in Australia, but in some instances the shed and the steel can be made somewhere else. Shed Boss sheds feature steel made by BlueScope Steel – which is 100% Australian made and guaranteed to meet or exceed Australian Standards. 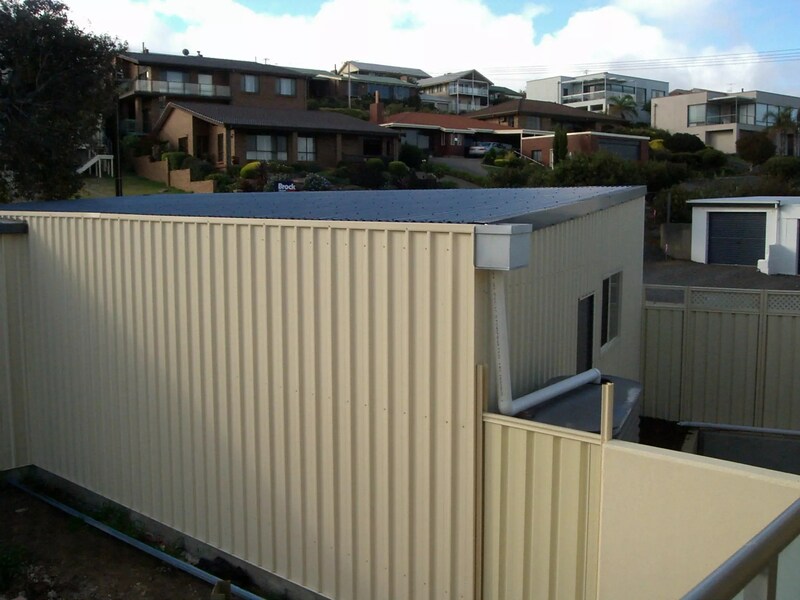 To comply with the Building Code of Australia (BCA) requirements, the steel used in a Shed Boss shed complies with the relevant Australian Standards.